Continued from "Aurangzeb Takes Over"
After the Persian invasion there came others. It was the same story of anarchy, bloodshed, loot and ravage repeated over and over again. There came the Afghans, Marathas, Jats and Rohillas, each of them ransacking the Seventh City of Delhi, grabbing whatever remained. “The scene of desolation filled my eyes with tears…. I could not recognize the houses and often lost my bearings. Of the former inhabitants there was no trace and no matter whom I enquired about, I was told that he was not there and nobody knew where he might be found. “Once through a ruined city did I pass. The people of Delhi suffered as never before, especially the poor and the middle class. The Emperor suffered too. There were huge debts everywhere which he could not pay because the royal treasury was empty. The officials and menials of the palace went unpaid for more than two years. The soldiers – numbering well over 82,000 – starved and grew desperate. There was total anarchy everywhere. And the Delhi government went bankrupt. Even the royal family was on the brink of starvation. The king had no conveyance for his state processions and had to walk up to the Jama Masjid from the palace. “Where there had once been the Peacock Throne, there remained a wooden platform painted over with garish flowers” wrote poet Mir Taqi Mir, “Princes whose ancestors filled the poets’ aprons with pearls have to stuff their ears against the wailing of their hungry kinsmen now. What was once a garden, lush and green, is wilderness now ….. not even a withered flower is seen. Time moved on. The struggle for power continued with vigour between the Marathas, the Rohillas and the Abdalis. The Abdalis dug out and carried away crores of rupees and other valuable objects which had been carefully buried and preserved and thus had escaped the notice of the previous invaders and also the royal family. They also carried away the Mughal princess Zohra who was married to Timur Shah, the invader’s son. Now it was the turn of the Marathas to ravage the Red Fort. Before long their canon balls reached the Hayat Baksh garden, the Diwan-e-Am, the Diwan-e-Khas and the imperial property within the palace. Two bastions of the Delhi Gate were demolished. 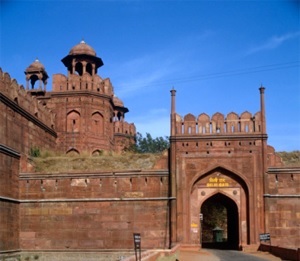 On September 3, 1757, the Marathas occupied the Red Fort. It had already been squeezed dry by the previous invading tribes. It was now damaged by the Marathas. During the next two months a severe fever raged within the city which affected the eyes, followed by an epidemic of brain fever. As if it were not enough, Delhi was rocked by a violent earthquake on November 21, 1757. The Marathas pulled down what remained of the ceiling of the Diwan-e-Khas and minted coins worth nine lakhs of rupees. During the two and a half months of Afghan occupation the royal family had to undergo intense suffering as a result of which 21 prices and princesses died within the brief span of two weeks. The queens were compelled to go about without their veils because the old ones were in shreds and there was no money to buy new ones. General Lake set up a Residency at Delhi with Sir David Ochterlony as First Resident and Chief Commissioner. The British granted a pension to Shah Alam for the maintenance of the royal family. But the Mughal Emperor was now just a shadow ruler with no power to speak of.